CreditDonkey.com recommends three credit card deals to start spring with bonus cash. As mailboxes continue to overfill with credit card offers, sorting through the promotions is daunting. CreditDonkey.com, a credit card comparison site, reviewed the top deals and compiled their latest list of the best credit card deals to help consumers start spring on solid footing. The right credit card depends on the consumer's individual circumstances. 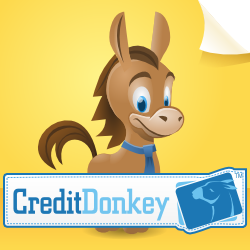 CreditDonkey.com compared generous rewards, low interest rates, low fees and helpful benefits to determine the best credit card deals for spring 2012. Plus, all CreditDonkey.com credit card deals include lucrative introductory bonus offers. "Consumers who pay in full should look for generous rewards. In contrast, consumers who carry a balance should focus on low interest rates," says Charles Tran, founder of the credit card comparison website, CreditDonkey.com. "Unless you are building credit, or are a high spender, most consumers should opt for credit cards with no annual fees." Visit CreditDonkey.com to view the updated Best Credit Card Deals for Spring list, including the top three credit card deals to celebrate spring with. The experts at CreditDonkey.com also recommend three types of credit cards this spring, depending on the individual’s needs. Travel Credit Cards: With the cold weather replaced with sunshine and the days longer, travel credit card deals offer consumers the opportunity to go on vacations or visit their family for less. “Don’t forget to compare annual fees. Travel credit cards with more lucrative deals tend to have an annual fee,” says Tran. Balance Transfer Credit Cards: The spring is not just for fun, it is also the season of spring cleaning. Look for introductory 0% APR credit card offers and save money. “If you are still carrying a balance from the holidays, consider a balance transfer to a low interest credit card. Several are offering introductory 0% APR for as long as 18 months,” says Tran. Cash Back Credit Cards: While travel rewards are nice, cash is king. Look for the best cash back credit card bonus and earn rewards. “It’s hard to beat the flexibility of cash. If you pay off your balance in full each month, cash back credit cards are usually a good bet,” says Tran. Consumers can visit CreditDonkey.com to compare credit card offers. CreditDonkey.com publishes reviews, deals and tips to help consumers make informed credit decisions. They can search, compare and apply online, finding the best credit cards for their individual needs.